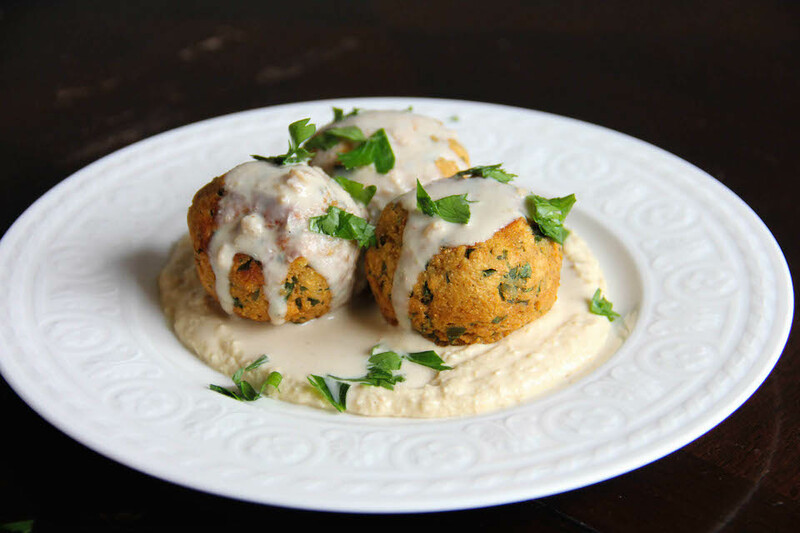 To make traditional falafel, you need to soak chickpeas overnight and then grind them in a food processor, before mixing in your herbs and spices. 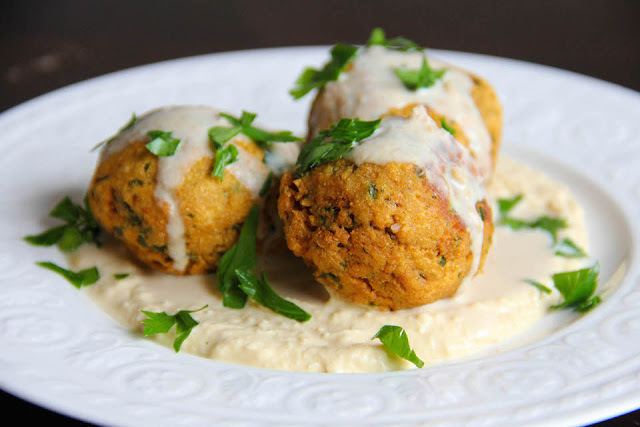 This will make epically delicious falafel (so if you have the time, make these ones from Yotam Ottolenghi's Jerusalem cookbook).... but it will also take up a lot of your time, and significant foresight. And let's say you're a sleep-deprived mother of two, who can barely find time to shower, and suddenly you find yourself starving with 15 minutes to spare (shower or eat? Shower or eat?! That is always the question).... well you should whip up a batch of these super easy falafel and feed yourself already! They're delicious, and they feel kind of special. They're made with chickpea flour, so there's no need to soak anything 12 hours in advance, and no need to break out the food processor. You should give them a try sometime. In a medium bowl, mix everything together, starting with the dry ingredients, then incorporating the wet. optional: Let the mixture rest for 5 minutes. This makes it easier to roll it into balls, but it is not crucial. Heat some oil in a frying pan on a medium/ medium-high heat. Form the mixture into golf-ball sized balls, and flatten them ever so slightly. When the oil is hot, fry the falafel on each side for about 4-5 minutes until golden brown, and cooked through. 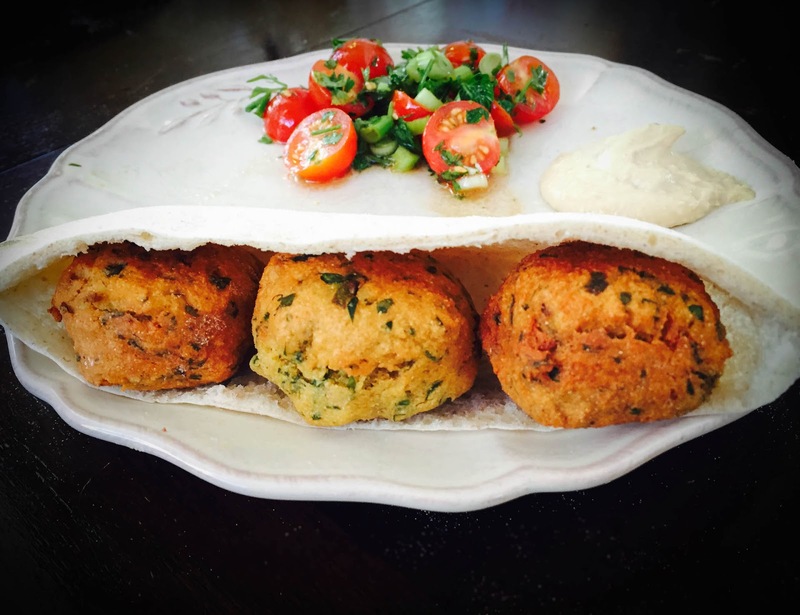 Use a slotten spoon to scoop out the falafel and place them on a paper towel to drain off excess oil. Serve hot, with tahini sauce (see recipe below) and hummus, or in a pita sandwich. We are on the same wavelength - we bought ingredients for falafel to have for dinner tomorrow night! I have never soaked chickpeas overnight but I do boil them for 10 mins and then have to use the food processor, this is such an easier method!!! Just bought some chickpea flour and looking for recipes to use it up. These sound perfect, can't wait to try them! This will be a quick meal but still tasty. That look so good ! It's nice to eat. I want to do but do not fear.